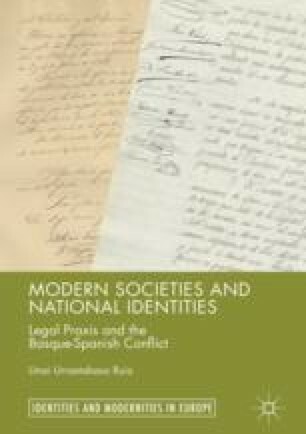 This chapter lays out the traditional historical narrative of the state of Spain. Generally, the relations of Vascongadas and Navarre are thought to have been amicable and collaborative with state authorities during the height of the Spanish Empire, a situation that would change, most notoriously during the nineteenth century, as the Ancient Regime was being dismantled and industrialization developed. At the turn of the twentieth century, the Basque-Spanish nationalist conflict would emerge. The chapter argues that such narratives generally overlook the existence of important historical continuities that tend to be considered puzzling or contradictory and that put into question some of their assumptions. Chapters 2 and 3 together articulate an alternative theoretical approach. Ad Concordiam. (2014). Concierto Económico/Economic Agreement. http://www.conciertoeconomico.org/en/about-the-economicagreement/overview/in-a-few-words . Accessed 31 Aug 2014. Biografías y Vidas, la enciclopedia biográfica en línea Online. (2014). Salustiano Olózaga. http://www.biografiasyvidas.com/biografia/o/olozaga.htm. Accessed 19 Oct 2014. Encyclopædia Britannica Online. (2014). Sancho III Garces. http://www.britannica.com/EBchecked/topic/521789/Sancho-III-Garces. Accessed 31 Aug 2014.